2019 Lincoln MKT Trim Levels with Comparisons & Configurations. What 2019 Lincoln MKT Trim Level Should you Buy? What is the Difference Between Trims? If you are in the market for a new luxury SUV, you might have already crossed paths with the 2019 Lincoln MKT. This wagon-esque vehicle has been in its first generation since 2010. After nine years, you would think that the MKT has changed a lot, but that just is not the case. Sure, new features have come into the mix, but this line-up feels a little bit outdated compared to most of its competitors for the 2019 model year. New for this year is the standardization of the 3.5-L V6 engine, which is capable of generating 365 hp and 350 lb-ft of torque. The base engine that used to come on the MKT has been totally discontinued. With just one engine option between the MKT's two trim levels, there is not a huge difference in terms of their mechanical features. Picking between the MKT's base Standard and line-topping Reserve trim levels should not be too terribly time-consuming. Still, if you are settled on buying an MKT, you should be aware of some of the differences between these two trims. At first glance, you might have trouble telling them apart, but once you get behind the wheel, you will likely notice some differences in terms of standard features that are offered, as well as a few optional features and packages. With that being said, read on through to the end of this comparison review. Once you reach its conclusion, you should have a clearer concept of which 2019 Lincoln MKT trim level is the right one for you. 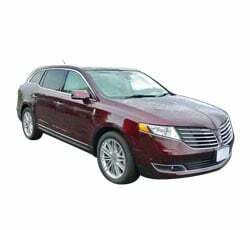 Compare the 2019 Lincoln MKT Standard vs Reserve Trim Levels. What is the difference? As we mentioned in the introduction, the Standard and Reserve are the only two trim levels available in the 2019 Lincoln MKT line-up. The Standard is th base trim, and it has a starting MSRP of $49,500. The Reserve, on the other hand, costs a bit more, with its starting MSRP of $52,500. The more optional features and packages that you tack on, the pricier this luxury vehicle becomes. You will also be paying quite a bit for fuel as both trim levels only get 15 mpg in the city and 20 mpg on the highway. Of course, if you are buying a luxury vehicle, chances are that your budget provides a little bit of leeway for this. Even so, be prepared to spend more than the starting MSRP for either trim. Both the Standard and Reserve are powered by the now-standard 3.5-L twin-turbo V6 engine. This engine is able to provide the MKT with surprisingly swift acceleration. The adaptive suspension that comes with the vehicle also helps to provide an exciting driving performance. It certainly does not make anyone miss the underwhelming V6 that got cut from the line-up this model year. Other mechanical features that both trim levels share are an all-wheel drive system, a 6-speed SelectShift automatic transmission equipped with paddle activation, and Lincoln Drive Control with electric power-assisted steering. Also, you can opt to equip the Class III Trailer Tow Package on either trim level. This gives you all of the equipment that you need to make the MKT into a capable tower. The biggest mechanical difference between these two trim levels are the wheels. The Standard trim level comes equipped with 19-inch premium painted aluminum wheels. The Reserve, however, gets larger 20-inch polished aluminum for some extra pizzazz. There are not too many distinctions between the MKT Standard and Reserve trim levels on the outside. You can order the Standard or the Reserve trim to be decked out in one of three standard body paint colors (Infinite Black, Blue Diamond, and Ingot Silver) or one of the five additional hues (Iced Mocha, White Platinum, Ruby Red, Burgundy Velvet, and Ceramic Pearl) for an extra fee of $695. The doors comes with color-keyed door handles that have chrome inserts. Both trims also have adaptive headlights, LED taillights, HID headlights, and exterior side mirrors that are heated, power-controlled, have a security approach feature, and have integrated turn signals. Also, the driver's side mirror is automatically dimming. There is also a power Vista Roof complete with sun shades for the front and rear. An Easy Fuel capless fuel filler also comes standard. As for window- and glass-related features, the Standard and Reserve trims each sport privacy glass on the liftgate, rear, and quarter windows. The front windows are made from acoustic-laminate glass for preventing wind noise from making its way into the vehicle's cabin. Additionally, the front windshield wipers are able to sense rain, and the rear window has a wiper, washer, and defroster. On the inside, these two trim levels are also pretty strikingly similar. With regard to climate control, both trims have tri-zone electronic automatic climate control with controls available for the rear seat. This certainly makes for a nice little bit of bonus comfort for rear seat passengers. In fact, all throughout the cabin, you will find plenty of standard comfort and convenience features. The Standard and Reserve trims share intelligent vehicle access with a push-button start mechanism, remote start, and a reverse sensing system. A power liftgate, power-adjustable pedals with memory settings, an automatically-dimming rearview mirror, and ambient interior lighting all get packed in as well. The heated steering wheel has a real wooden insert and numerous controls mounted onto it for easy access. The shift knob is wrapped in gorgeous leather, and the power steering column is tilt-and-telescoping. Other creature comforts include theater dimming on the entry lights, one-touch-up/-down and global open power windows, a universal garage door opener, door pockets for every single door, a net for the cargo area, a locking glove box, and a 100V/150W AC power outlet. The standard infotainment system is the SYNC 3. Both trim levels get the benefit of having navigation built into this system, and SiriusXM Travel Link, Taffic, and Satellite Radio can be connected. There is also an HD radio and THX II Certified sound system included. The seats themselves are also the same in both trim levels. The Standard and Reserve each have seats in the front and rear that are decked out in Bridge of Weir leather. The comfort bucket seats up front are power-adjustable 12 different ways, have power lumbar support, and are heated and ventilated. Seven seats come standard, but if you wish to take one away for the additional cargo room, you can narrow the seat number down to six on either trim level. If you do keep the third-row seat, know that it is power-folding and can go down pretty flat. The second row of seats is a 60/40 split bench that has heating for the two outboard seats. If you want, you can opt for them to come with a power-folding capability as tumble bucket seats. With the bucket seats equipped, you can also opt to include a refrigerated console in the second row. Pretty luxurious, right? Well, the luxury does not stop there. It continues on with the list of safety features that get slapped onto these two trim levels. Even the base Standard trim level comes with a good amount of driver aids. A blind spot monitoring system with a rear cross-traffic alert comes equipped on the Standard and Reserve. The Reserve does get the addition of a forward collision warning system with brake support and adaptive cruise control. Additionally, both the Standard and Reserve trims come with a rearview camera, personal safety system, a feature that monitors front seat passengers, and a safety canopy system that has side curtain airbags and a rollover sensor for extra security measures. There is a SOS post-crash alert system that kicks in, in the event of an accident. Other standard safety features include an anti-lock braking system with power four-wheel disc brakes, the AdvanceTrac system with Curve Control and Roll Stability Control, a tire pressure monitoring system, a safety belt reminder for the front seats, and child safety locks for the rear doors. To beef up vehicular security, Lincoln adds a few key features as well. The MyKey system allows you to customize the key settings for other drivers of the MKT. This is especially handy if you have teens learning how to drive. A perimeter alarm, keyless entry keypad, passive anti-theft system, and remote keyless entry also help to deter theft and let you quickly get into your vehicle when you need to. For the most part, the Standard and Reserve have the same add-on options. As already stated, they both have the exact same body paint options and Class III Trailer Tow Package. The Reserve does standardize a Technology Package, Reserve Model Equipment, and the all-weather floor mats (which are set aside as being purely optional on the Standard trim). Overall, you will not find too many differences between the 2019 Lincoln MKT's two trim levels. The Standard and Reserve can be easily mistaken for one another, and only a few nitty-gritty details on the inside help to distinguish them. The biggest difference, obviously, is the price tag. Since you are essentially getting almost the same thing, you might as well save yourself a few thousand dollars and go for the Standard trim. It is not as well-equipped as some other luxury vehicles, but it has the basics pretty well-covered. The Reserve is just not upgraded enough to warrant a recommendation. Perhaps the MKT's impending overhaul will see some changes in this regard. At least, we can hope that it will happen.